Ann is a graduate of Wheels for Wellbeing, the social inclusion charity supporting disabled people to cycle in South London. With their help she tried cycling and enjoyed it so much she bought her own trike to use as a mobility aid. A long and successful journey to a more independent life. You’d think so, until you’re stopped in your tracks by officious anti-cycling dogma. A one-off? Just a misunderstanding? Unfortunately not. I met Ann at the Cycle Show back in October and in a lull we got chatting about the Sky Ride. There were sections where riding wasn’t allowed and she was stopped from riding her trike at a walking pace. Here’s another challenge folks, find me a paralympian who can push a trike whilst walking on crutches. If Linford Christie and Paula Radcliffe arrived at the South Bank on mobility scooters, PCSOs would part like the Red Sea. Come on Boris, you can spot common sense when it’s down and out for the count. How about showing the lady some respect and giving back her dignity? 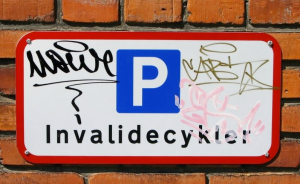 And once that’s sorted, what about some disabled cycle parking?